This post has been long overdue guys! 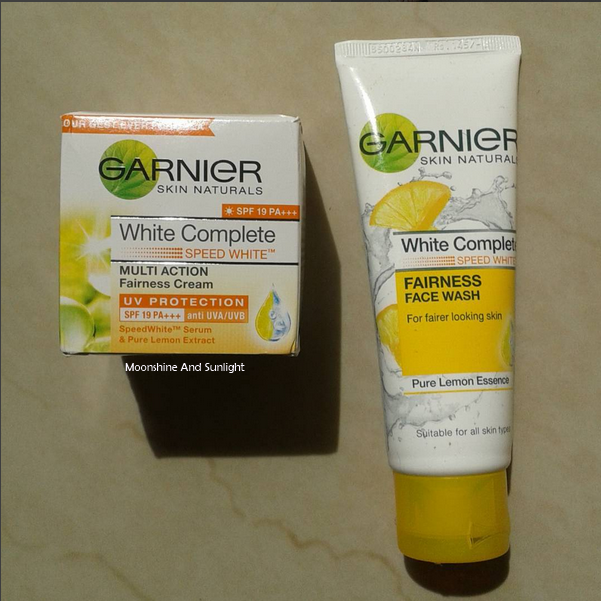 I had taken a 7 day challenge from Garnier, before going on the break , which was using the Garnier white complete Fairness cream and the White complete face wash. The smell of this product is really nice. Not repelling at all, which is the trend in case of fairness creams as I have seen. The texture is really light and absorbs after a while. Yeah, it takes a while to settle in. After it settles down , I have to say that it does not look chalky or give a ghostly white cast, but it does brighten your face. It is not very moisturising,I have found, but okay for humid summers. In the course of 7 days, I did not notice any whitening as such, maybe if I had used for long, I would have seen something. Now this I have used long back ,when it was first released in the market and I was least bothered about what I use. But, since they have done some changes to the formula ( as they claim), I thought of giving it a try again. And I was not disappointed. It’s not very drying and does a proper job, but you have to follow up with a moisturiser. I am happy that I took this challenge, it forced me to step out of my zone and do something. If you would like to try these just drop me a mail on priyanjanamns@gmail.com , with your address and Garnier will send you samples to try these out! Make sure you send me your details!